Peruvian & Chilean - Dark Quest is a son of Snowmass Nova, which sold for $335,000 in 2006. He is a stunning example of a true black show ring winner that is destined to continue the Nova legacy. Out of a true black canadian dam giving him a strong black lineage, Dark Quest exhibits an advanced elite fleece which combines fineness, crimp definition and uniformity which can be hard to come by in true black. The demand for elite fiber is resounding throughout the world and you can produce it in COLOR with Dark Quest's genetics. 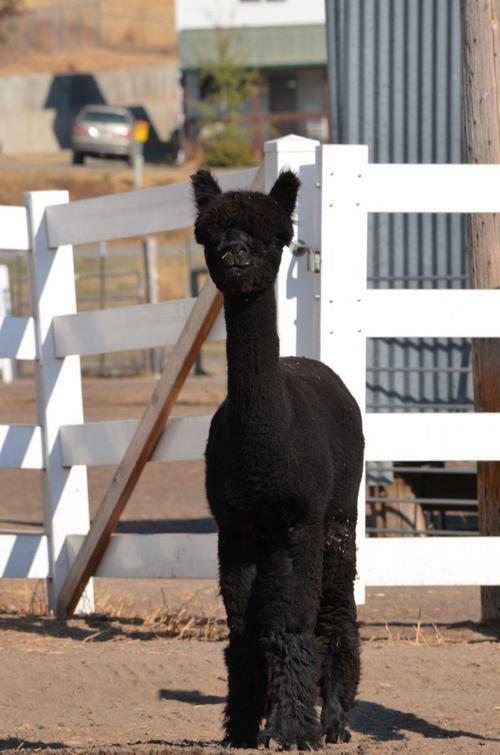 His first cria have arrived in true black color...Dark Prince...4 shows & 4 blue ribbbons with one Reserve Champion under 4 different judges....it doesn't get any better than that!!! Ask us about Daytona's discounted stud fee for 2019. Daytona's 2018 cria (all daughters!) have proven just how capable Daytona is at producing black with such a variety of dam colors. 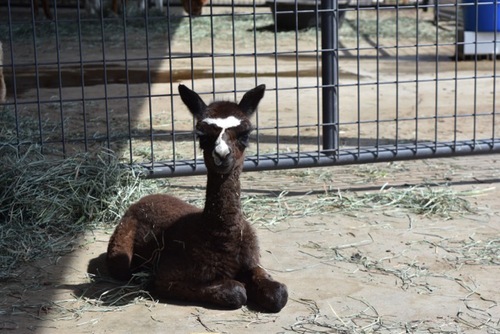 We are thrilled with this year's cria. Just like those of 2017, his cria are dense, silky, crimpy, extremely well put together conformationally, and have such lovely presence. Daytona commands your attention with her almost blue true black color and phenomenal head. She also has excellent bone substance, a strong conformation, and an extremely soft handling fleece. Daytona is out of generations of black and champion genetics. Daytona's dam, Sweet Pines Bugatti, is a champion daughter of Onyx de Mico, a champion himself and producer of MANY award winning offspring. Bugatti throws that teddy bear head every time, has been an excellent mother with plenty of milk, and her dark color genetics shine through in high quality fleeces. Bugatti's own fleece won Brown Color Champion at a Level 4 fleece show. She also won 1st place in halter, the judge noting her tremendous style. 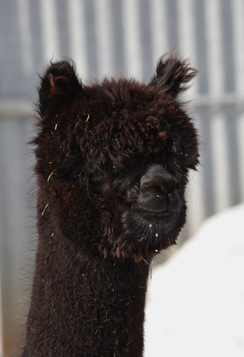 The genetics on Daytona's dam's side include Peruvian El Moustachio and true black Michelangelo. The genetics on Daytona's sire's side are packed with generations of black and grey along with elite Snowmass lines. 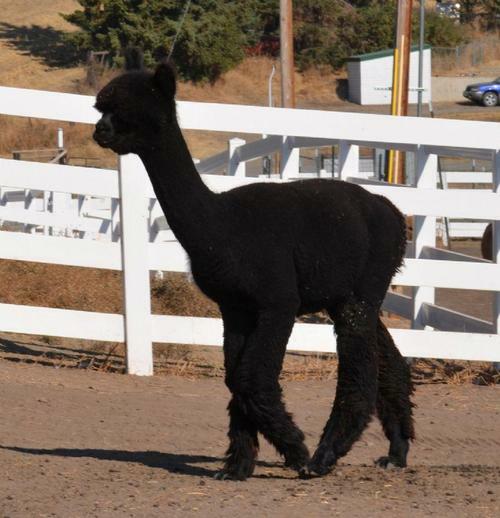 Daytona's sire is Snowmass Nova's Dark Quest, a son of the esteemed Snowmass Nova and producer of many top award winners for Wolf Den Alpacas. 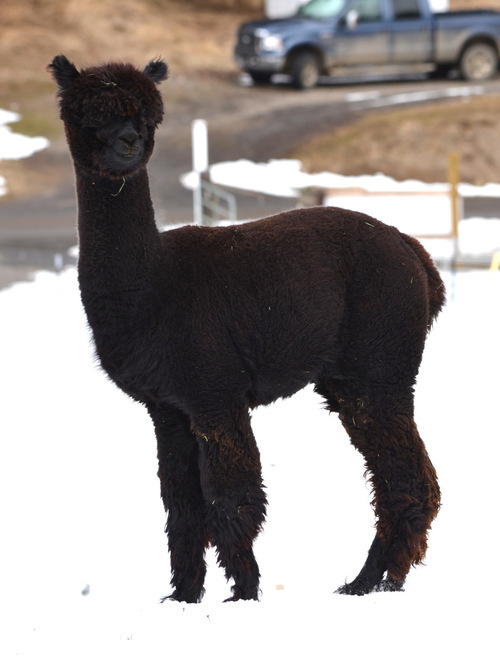 The pedigree behind Snowmass Nova's Dark Quest also includes Snowmass Peruvian Casanova (Herdsire of the Year), Peruvian Drambuie and Peruvian Bueno.